I am just arriving to Cesena Italy for this year’s Global Wellness Summit and I find myself reminiscing about the summit from two years ago in Kitzbuhel, Austria. Kitzbuhel, a small town in the Austrian countryside, was the perfect setting for a wellness conference because the whole area oozes wellness. Every hotel is a “wellness” hotel, the “aufguss” sauna culture is everywhere, and the entire countryside is a giant playground for outdoor sports. This was the year that I launched the Digital Wellness initiative for Mandarin Oriental Hotel Group and I had spent much of the year traveling around the world and talking to people about their challenges with technology. It was through these conversations that I came to realize how pervasive the impact of technology on wellbeing actually was. I met with people from cities all around the world, and they all had stories to tell of the challenges they had establishing boundaries around their technology use. But not in Kitzbuhel. In rural Austria there was a different reality. Parents did not use Ipads as babysitters, teens were not glued to their screens all day, and adults did not spend their spare time staring at monitors. I could see why. During my brief stint in the glorious beauty of Kitzbuhel, I wanted to spend as much time outdoors as possible. I went running every morning. When there were breaks in the conference, I strolled around the scenic town, I hiked up the mountain, or I “schvitzed” in the sauna. Who had time to waste on Facebook? It made me realize the power of nature. 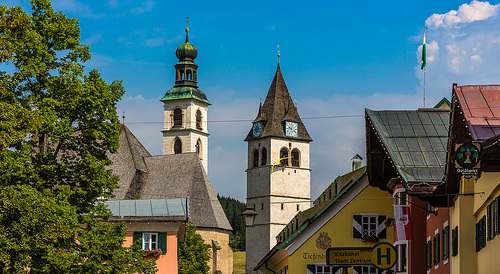 The backdrop of Kitzbuhel affords residents and visitors the opportunities to play, to move their bodies, to relax, to appreciate beauty, and to share amazing experiences together. I wanted to move there. But in the urban environments where I live and had been traveling, those opportunities are increasingly scarce. We come to the cities seeking wealth, information, opportunities, and productivity. But we leave the beauty of the natural world behind, trading in the Garden of Eden for our concrete cells. With less space to move, fewer opportunities for play, less beauty to appreciate, and more barriers between people, city residents turn to technology to fill the void. And fill the void it does. We urban denizens get great benefit from our devices. Peering through our little screens we find great beauty, amazing entertainment, and rich sources of knowledge. Perhaps most importantly, we can establish meaningful connections with other people all around the world. But the benefits of technology come with a price. With less opportunities to move our bodies, we turn more to technology for play and entertainment, and our bodies become less accustomed to moving. Technology brings great convenience, and we become dependent and less self-reliant. And while we turn to technology to counteract urban loneliness, making connections with people through virtual networks, we become less able to connect in real life. Technology becomes a self-fulfilling prophecy. The more we use it, the more we need it. Virtual activity replaces physical activity. Virtual memory replaces mental memory. Online relationships replace real connections. Artificial intelligence replaces intelligence. Some futurists predict that eventually, we will upload our consciousness into the cloud and shed ourselves completely of our messy and flawed physiological systems. But not in Kitzbuhel. In Kitzbuhel, you need to use your body, if only to force it—heart pounding and lungs heaving—up to the highest peaks you can find, to soak in the sun rising over the black Schwarzee lake. In Kitzubhel, you celebrate your messy, sweaty physiology in elaborate sauna rituals that bring the mind and body to new heights. In Kitzbuhel, you begin to wonder why you ever thought it was a good idea to spend time staring at your devices. As I travel to Cesena for this year’s summit, I wonder if I will find a similar magic in the Italian countryside. I’m hopeful that I will. While technology eases the works of human in one aspect and it gives pressure in some other aspect, especially more on psychological aspect. For example, the development of mobile usage and social media interactions minimises the actual social interactions to a great extent which result in psychological issues.